It was officially confirmed today that that Hereditary Prince Gottfried of Hohenlohe-Langenburg will marry Princess Margarita of Greece and Denmark at Langenburg on April 20, reports the Chicago Tribune. Prince Gottfried has "many American friends on both sides of the Atlantic" and accompanied his aunt, Queen Marie of Romania on her trip to the United States five years ago. 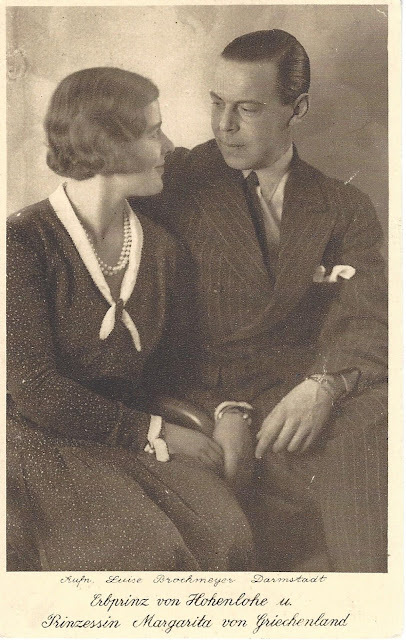 The announcement of his engagement to Princess Margarita, eldest daughter of Prince Andrew and Princess Alice of Greece, "definitely settles the rumors of his engagement to Mrs. Reginald Vanderbilt." For several years, there were reports that "he would make a match with the former Gloria Morgan," but her parents consistently denied the rumors, despite "the fact that the couple were seen constantly together." Only three weeks ago, "leading American newspapers" published photos of Gloria Vanderbilt as Gottfried's future bride. Gloria Vanderbilt, the mother of a young daughter, also named Gloria, was widowed in 1925. The marriage between Prince Gottfried and Princess Margarita is said to be a major royal event as "half the royal personages remaining in Europe are said to be interested in this wedding." Queen Marie, who was recently in Paris, is now on her way to Dinard, France, to visit to her sister, Grand Duchess Victoria of Russia, before traveling to Langenburg. Their sister, Alexandra, is Gottfried's mother. Their youngest sister, Infanta Beatriz, lives in Spain. Princess Margarita, who was born at Athens in 1905, is the eldest of the "four handsome daughters" of Prince Andrew and his wife, Princess Alice of Battenberg. She also has a younger brother, Philip. In recent years, Princess Margarita and her family have lived in St. Cloud, near Paris, "where she often entertained American friends." Her uncle, Prince Christopher of Greece's first wife, Princess Anastasia, was born in the United States. Princess Margarita is a great-great-granddaughter of Queen Victoria, while her fiance is a great-grandson of the late Queen. The princess is the last of her sisters to marry. Her younger sisters, Theodora, Cecilie and Sophie are married to Prince Max of Baden, Hereditary Grand Duke Georg Donatus of Hesse and By Rhine, and Prince Christoph of Hesse, respectively.